Travel is a constant in Foreign Service life. Here’s how to make it serve your personal fitness goals. Ken Seifert demonstrates the elevated pushup. Ken Seifert demonstrates the squat and elevated trap row exercises. As members of the Foreign Service community, we travel constantly. While living abroad and traveling as much as we do require us to make sacrifices (cultural familiarity, time with family, watching the latest season of “Game of Thrones”), exercise does not have to be one of the things we sacrifice. Stop thinking of time spent in airports as wasted hours; instead, think of those long layovers as fitness opportunities. What exactly am I talking about when I tell you to exercise in airports? The options are endless. From stretching to speed walking, there are many obvious ways to burn calories. But there is a world of possibility that goes beyond the basics, and in my 20 years as a traveler and fitness trainer, I have developed some techniques for an intense fitness program you can commit to on the road. Here are a few examples. First, consider your cardio options—those high-intensity exercises that get your heart going. Many airports—Miami International Airport is one example—offer staircases leading up to airport trams or down to other gates. Using those stairs to run up and down is a great way to burn calories. If you add your bags to this cardio exercise, you’ll really give your muscles a workout. Just remember to pick up your knees and don’t overextend your back. Go up and down a few dozen times or more—you’ll burn calories and can most definitely scratch off the “squat” workout for the day, as stair climbing will hit the same muscles as squats. My favorite form of airport exercising is running. 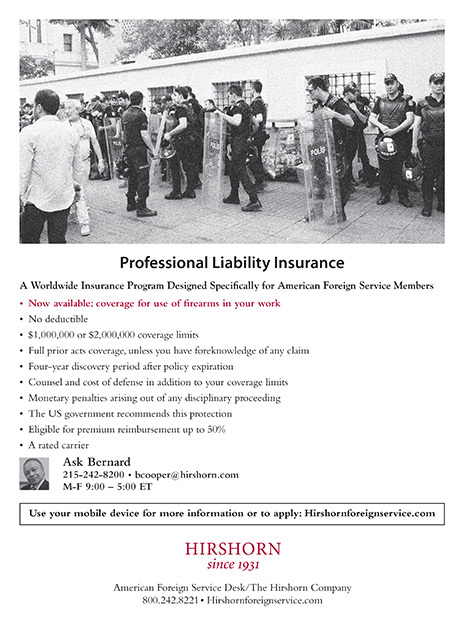 I have been running in and around airports in hundreds of domestic and international locations. Those long, vast terminals in places like Frankfurt and JFK offer seemingly endless real estate to run. It’s an especially great way to use those wasted hours during long layovers and justify that extra donut. To make sure you’re ready to run, consider wearing running shorts under your clothes, packing efficiently and researching possible running paths near or inside the airport. In 20 years of airport-exercising, I have never been stopped or questioned by TSA or other airport officials, because I go out of my way to be mindful and conscientious of others. You can also sit in an airport chair and raise your knees toward your chest, one at a time—the faster, the better. The higher the raise, the harder the exercise. Keep it up for 20 minutes—not only are you burning calories, but you are also strengthening your stomach muscles. Or bring a jump rope with you, find a quiet, small area of the airport, and jump. You can burn several hundred calories in 15-20 minutes of idle time. Use the airport seats for your weight-bearing exercises for arms and legs. You can use the seats to do seated tricep dips or assisted pushups. 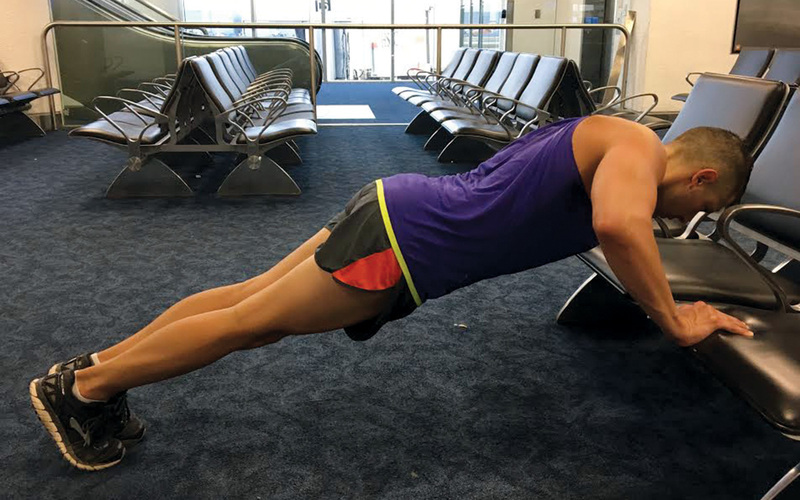 To do tricep dips, face away from the seat, straighten your arms and place the palms of both hands against the edge of the airport seat behind you. Extend your legs out in front of you while you dip up and down with your arms, keeping your back straight and allowing for a full range of motion. You can also do pushups. If you do them on the ground, use paper towels to protect you from the floor, which may not be clean—or use a chair instead and do elevated pushups (see illustration). I bring resistance bands to do a whole range of arm workouts, but you can also use everyday objects (like a heavy carry-on bag) to achieve a more intense workout. 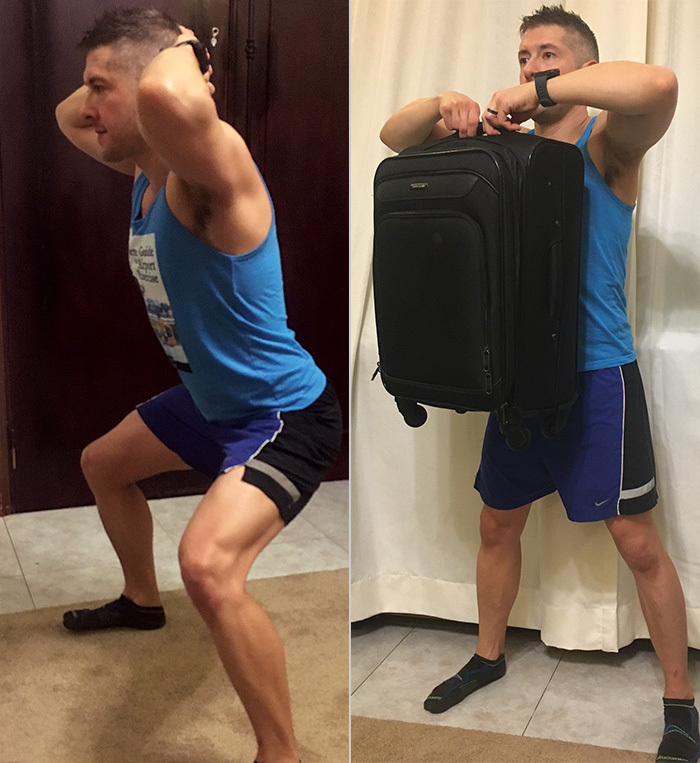 A normal carry-on bag is essentially a big dumbbell—use it to curl up and down in slow, steady motions to work the biceps. Or do an upright trap row—hold the bag in front of you, raise the bag up to your chin until your arm makes a 90-degree angle with your torso, and then back down (see illustration). This works the shoulders. To work on your legs, do stationary squats (see illustration). With your hands clasped behind your head, squat down with your backside pushed out behind you until your legs bend to a 90-degree angle. Go up and down in controlled and steady motions. Be sure your knees don’t extend beyond the ends of your shoes. If you’re uncomfortable working out next to your fellow travelers, you can look for a gym. Some airports have such facilities, but they can be crowded and expensive, which may be deterring factors. The site airportgyms.com posts information about the location of airport gyms in Canada and the United States. One of the most frequent questions I get is how to manage bags. The baggage storage offices in most airports are relatively inexpensive and a quick way to store items for short periods. You can also consider using your personal items as part of your workout routine—for example, you can run with the backpack for a little extra weight. The other concern that many travelers have is what to do about cleaning up. No one wants to be “that guy” who smells up the plane. However, maintaining good hygiene is not only possible but relatively easy with some advanced planning. Pack soap, wipes and washcloths in your carry-on bag. Use family restrooms to give you more space. Pack extra shirts and plastic bags to store sweaty items—all of this can make the clean-up process go smoothly. I encourage everyone within our diplo-family to consider how to fit exercise routines into airport layovers. With relatively little hassle and investment, it is easy to make goals and stick to exercise plans, regardless of your itinerary. You’ll be surprised how easy it is to incorporate exercise techniques into your travel routine. And you will never look at airports the same way again. Remember that these are recommendations from a fellow FS traveler. Naturally, before beginning any exercise program, it’s always advisable that you first talk to your health care professional. Ken Seifert has worked for USAID for 14 years, 10 of which have been spent as a Foreign Service officer in Central America, the Caribbean, Africa and Asia. He is a fitness guru who exercises nearly four hours a day, even when he travels. 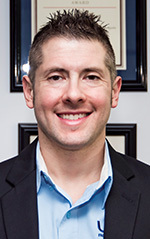 In 2017, he wrote The Complete Guide to Airport Exercise, which has been featured on NBC, CBS, ABC, Fox and NPR national and local affiliates, among others. His previous publications include The Rising Storm (AuthorHouse, 2007) and hundreds of letters to the editor and op-ed pieces in such newspapers as The Washington Post, USA Today, Miami Herald, Austin American-Statesman, the St. Louis Post Dispatch and the Denver Post. He is married and has two dogs.